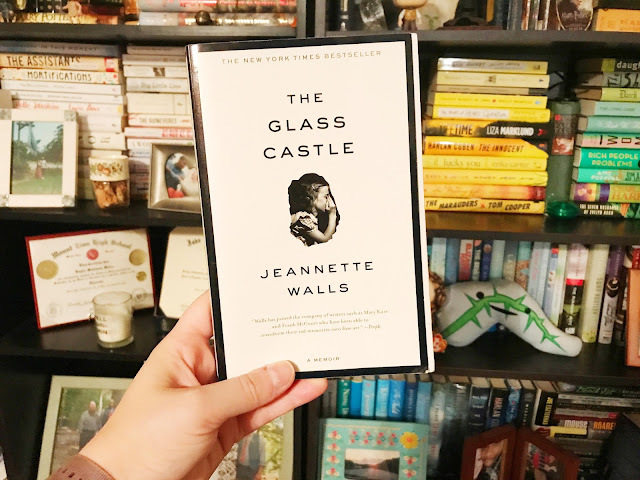 There was recently a whole lot of hoopla surrounding The Glass Castle because it was being made into a movie, so I chose it to fulfill my 2017 reading challenge prompt for "a book that's becoming a movie in 2017." I'll say that while the book was interesting, it wasn't something I thoroughly enjoyed. In fact, it took me close to a week to read it, because it was just very slow-paced. Brief synopsis: Growing up, Jeannette had a difficult life. Her father an alcoholic. Her mother perhaps a bit insane. The Walls family moved around a lot - throughout the desert, across the country. They were oftentimes sleeping in the back of their car, or a home that was truly dilapidated. The Walls' kids had to grow up and fast, and truly learn the hard way how to survive on their own in this world. Jeannette and her siblings only really had each other to rely upon. The Glass Castle is one of perseverance and dedication to finding a life that was worth living. The thing about memoirs is it's typically hard to believe that the story you're reading actually happened to someone in real-life. I'm a big believer that everyone has their own truth (see: my thoughts on the James Frey controversy), but sometimes that truth can be a hard pill to swallow. Reading memoirs usually reminds me of how privileged my life has been - how easy I've really had it in life. The stories being told are of course interesting, or they wouldn't be written into best-selling books. From living in the desert to dilapidated buildings in small towns, to being bullied by teachers, to becoming an adult before she even hit the double-digits, Walls certainly had an interesting story to tell. As a reader, it was difficult to not pity her and her siblings - but I have a feeling she would hate being pitied. The story is a heart-breaking one, but it's also incredibly inspirational. The story was one that needed to be told, however, I did find it to be a little slow, which isn't my usual interest. While this is a book a think a ton of people would be in love with, it wasn't my favorite - not because it wasn't well-written or anything; it just wasn't my style. If you enjoy inspirational memoirs, or stories of struggles overcome, The Glass Castle is for you. Or if reading's not your thing, the movie is in theatres now. I love a good inspirational read- this sounds good! Also, did you change up your blog a little? Looks great! I love the sign off of "the movie is in theaters now" hahaha I think I will stick with the movie! Lol. Sometimes - not often, but sometimes - the movie can be more enjoyable (for example, Cold Mountain). This is one of my all-time favorite books. I don't think I want to watch the movie because I love the book just tooooooo much. I'm glad you love it! I always like to watch the movies too, but by reading first I can form my own perceptions.